It’s pruning time in my garden. 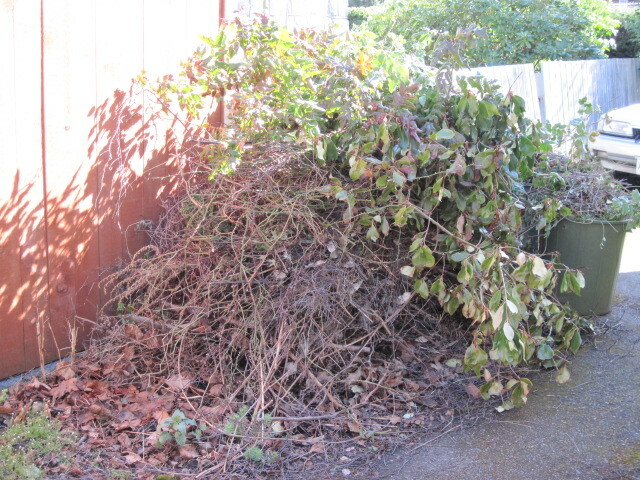 Late winter is an appropriate time to prune many trees and shrubs, but the reason I prune in March is because of “Compost Day.” Once a year, the municipality picks up garden debris piled on the boulevard by residents. Just once. The rest of the year we have to dispose of this stuff ourselves. Hauling long, sometimes prickly branches to the municipal yard is not easy, unless you have a pickup truck or utility trailer, which I don’t. Even then it’s not a fun trip, for a variety of reasons. So I make the most of the Compost Day pickup. 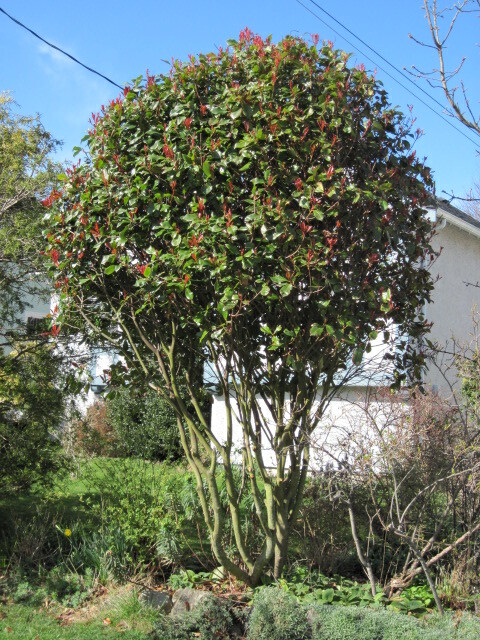 In the past few weeks I have performed selective amputation on a climbing rose (‘New Dawn’, I suspect), a tall photinia and an Oregon grape. I find pruning to be the most difficult of garden operations, in part because it is irrevocable. Cutting pieces off a shrub I want to have in my garden, growing and prospering, seems counter-intuitive. Obviously, I don’t want to kill or damage it. Pruning is supposed to be beneficial, resulting in improved appearance or better flowering, but the immediate result is slanted stubs where there used to be bushy limbs. The sad truth is that many gardeners don’t dream of pruning until the little shrub from the two-gallon pot turns into a hulking monster blocking access to the front door, and Something Must Be Done. Before I commence a pruning operations, I ritually consult a book that was recommended as simplifying the whole business and making it crystal clear — Pruning : a practical guide by Peter McHoy (Abbeville Press, 1993). It has no doubt been superseded in the nearly two decades that have passed, but by now I am convinced that you can’t really learn to prune by reading about it, so I haven’t bothered to seek out any other books on the subject. Still, as a psychological aid, I dutifully consult Mr. McHoy before I get out the secateurs and saw. McHoy describes nine different pruning techniques, each one appropriate for a specific group of plants. His book also has an A-Z section (by Latin name) in which you can see which of the nine is recommended for the plant you wish to prune. One of the simplest is trimming the outer growth of a shrub, achieving a bun-like or lollipop shape. This is the only technique many people use, which explains all the gardens you see full of shrubs that all look more or less alike, even though they are of different species. Another easy technique is cutting back to the ground or at least to a framework of old stumps — a no-brainer, as they say. Just cut off all the stems, every one of them, making sure you slant your cuts. You get the picture. Once cut, a stem can’t be put back, so you have to visualize what the plant will look like before you make your amputations. I have circled a shrub many times, secateurs in hand, dithering over this stem or that stem and working myself up to a state of high anxiety before I snip. If pruning is painful for the plant, the gardener suffers right along with it. Another thing that makes pruning difficult is the fact that the best foliage is usually found on the ends of stems and branches, because this is where the newest, freshest growth is. It feels wrong to cut this off, leaving a stub of older wood. And yet roses, to give an example, are rejuvenated by cutting them down to stumps. In spring they put out all sorts of bushy new growth and all is well. But at pruning time, all you can see is that you are about to remove what looks like perfectly healthy growth. I suppose this is yet another reason why gardening is a craft that takes a long time to learn. I can’t say that I have actually harmed a shrub by pruning it. Most likely I have achieved less than spectacular results by choosing not to prune, or by doing so too timidly. That’s hard to believe, though, when you look at the pile of stuff I have waiting to be hauled away on Compost Day. All this from a 50 x 120 foot lot! And more to come through the rest of the year.